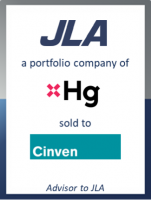 GCA Altium acted as financial advisor to the management team of JLA, a portfolio company of HgCapital and a UK-based sector leading critical asset supply and services business for laundry, catering and heating. Founded in 1973 and headquartered in Ripponden, West Yorkshire, JLA employs c. 900 people and provides commercial laundry, heating solutions and catering equipment to over 25,000 small and medium enterprises. JLA’s services are typically provided to customers who operate across care homes, hospitality, education, housing associations and student accommodation. The transaction delivered a 4.9x return and a c. 26% gross IRR to HgCapital, who acquired JLA in 2010 and completed 16-bolt on acquisitions over its investment period. JLA more than doubled in size during HgCapital’s investment, successfully developing new product categories and significantly growing total employment. The transaction is subject to FCA clearance.